Volunteers build a large deck on the home of Shaun and Nicole Meadows. 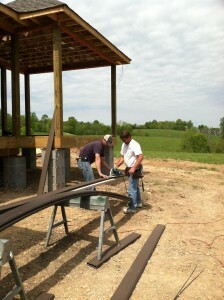 Goodall Homes coordinated and participated in "Deck Day" on Friday, April 13, 2012. Volunteers from Goodall Homes and several of our trades and vendors participated in building a deck on the home of Shaun Meadows', a Veteran whom we are honoring with the gift of a new home to be completed toward the end of May. To view a video with a complete update on this home, please click here. We would like tho thank all of those who are sacrificing time, money, and energy in making this dream come true for Shaun and Nicole!